Galba - Museum of Fine Arts of Lyon. Laureate head right; IMP. SER. GALBA CAES. AVG. TR. P.
Servius Sulpicius Galba (/ˈsɜːrviəs sʌlˈpɪʃəs ˈɡælbə/; Latin: Servius Sulpicius Galba Caesar Augustus;[note 2] 24 December 3 BC – 15 January 69 AD) was Roman emperor from 68 to 69, the first emperor in the Year of the Four Emperors. He was known as Lucius Livius Galba Ocella[note 3] prior to taking the throne as a result of his adoption by his stepmother, Livia Ocellina. The governor of Hispania at the time of the rebellion of Gaius Julius Vindex in Gaul, he seized the throne following Nero's suicide. Born into a wealthy family, Galba held at various times the offices of praetor, consul, and governor of the provinces Aquitania, Upper Germany, and Africa during the first half of the first century AD. He retired during the latter part of Claudius' reign but Nero later granted him the governorship of Hispania. Taking advantage of the defeat of Vindex's rebellion and Nero's suicide, he became emperor with the support of the Praetorian Guard. His physical weakness and general apathy led to his being dominated by favorites. Unable to gain popularity with the people or maintain the support of the Praetorian Guard, Galba was murdered by Otho, who then became emperor. Galba was not related to any of the emperors of the Julio-Claudian dynasty, but he was a member of a distinguished noble family. The origin of the cognomen Galba is uncertain. Suetonius offers a number of possible explanations; the first member of the gens Sulpicia to bear the name might have gotten the name from the term galba, which the Romans used to describe the Gauls, or after an insect called galbae. One of Galba's ancestors had been consul in 200 BC, and another of his ancestors was consul in 144 BC; the later emperor's father and brother, both named Gaius, would hold the office in 5 BC and 22 AD respectively. Galba's grandfather was a historian and his son was a barrister whose first marriage was to Mummia Achaica, granddaughter of Quintus Lutatius Catulus and great-granddaughter of Lucius Mummius Achaicus; Galba prided himself on his descent from his great-grandfather Catulus. According to Suetonius, he fabricated a genealogy of paternal descent from the god Jupiter and maternal descent from the legendary Pasiphaë, wife of Minos. Servius Sulpicius Galba was born near Terracina on 24 December 3 BC. His elder brother Gaius fled from Rome and committed suicide because the emperor Tiberius would not allow him to control a Roman province. Livia Ocellina became the second wife of Galba's father, whom she may have married because of his wealth; he was short and hunchbacked. Ocellina adopted Galba, and he took the name Lucius Livius Galba Ocella. Galba had a sexual appetite for males, whom he preferred over females; according to Suetonius, "he was more inclined to … the hard bodied and those past their prime". Nevertheless, he married a woman named Aemilia Lepida and had two sons. Aemilia and their sons died during the early years of the reign of Claudius (r. 41–54). Galba would remain a widower for the rest of his life. Galba became praetor in about 30, then governor of Aquitania for about a year, then consul in 33. In 39 the emperor Caligula learned of a plot against himself in which Gnaeus Cornelius Lentulus Gaetulicus, the general of the Upper German legions, was an important figure; Caligula installed Galba in the post held by Gaetulicus. As commander of the legions of Upper Germany, Galba gained a reputation as a disciplinarian. Suetonius writes that Galba was advised to take the throne following the assassination of Caligula in 41, but loyally served Caligula's uncle and successor Claudius (r. 41–54); this story may simply be fictional. Galba was appointed as governor of Africa in 44 or 45. He retired at an uncertain time during the reign of Claudius, possibly in 49. He was recalled in 59 or 60 by the emperor Nero (r. 54–68) to govern Hispania. A rebellion against Nero was orchestrated by Gaius Julius Vindex in Gaul on the anniversary of the death of Nero's mother, Agrippina the Younger, in 68. 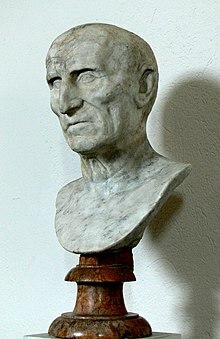 Shortly afterwards Galba, in rebellion against Nero, rejected the title "General of Caesar" in favor of "General of the Senate and People of Rome". He was supported by the imperial official Tigellinus. On 8 June 68 another imperial official, Nymphidius Sabinus, falsely announced to the Praetorian Guard that Nero had fled to Egypt, and the Senate proclaimed Galba emperor. Nero then committed assisted suicide with help from his secretary. Obverse Portrait of Galba, AD 68-69, Roman Mint. Obverse: Laureate haed right; IMP. SER. GALBA CAESAR AVG. Reverse: Victory standing on globe left, holding wreath and palm branch; VICTORIA P. R.
Upon becoming emperor Galba was faced by the rebellion of Nymphidius, who had his own aspirations for the imperial throne. However, he was killed by the Praetorians before he could take the throne. While Galba was arriving to Rome with the Lusitanian governor Marcus Salvius Otho, his army was attacked by a legion that had been organized by Nero; a number of Galba's troops were killed in the fighting. Galba, who suffered from chronic gout by the time he came to the throne, was advised by a corrupt group which included the Spanish general Titus Vinius, the praetorian prefect Cornelius Laco, and Icelus, a freedman of Galba. Galba seized the property of Roman citizens, disbanded the German legions, and did not pay the Praetorians and the soldiers who fought against Vindex. These actions caused him to become unpopular. On 1 January 69, the day Galba and Vinius took the office of consul, the fourth and twenty-second legions of Upper Germany refused to swear loyalty to Galba. They toppled his statues, demanding that a new emperor be chosen. On the following day, the soldiers of Lower Germany also refused to swear their loyalty and proclaimed the governor of the province, Aulus Vitellius, as emperor. Galba tried to ensure his authority as emperor was recognized by adopting the nobleman Lucius Calpurnius Piso Licinianus as his successor. Nevertheless, Galba was killed by the Praetorians on 15 January, followed shortly by Vinius and Piso. Their heads were placed on poles and Otho was then acclaimed as emperor. ^ The Royal Titulary of Ancient Egypt. ^ Suetonius & Rolfe 2018, Life of Galba, p. 193. ^ a b c d Greenhalgh 1975, p. 11. ^ Morgan 2005, p. 31. ^ Morgan 2005, pp. 31–32. ^ Suetonius & Rolfe 2018, Life of Galba, p. 227. ^ a b c Lendering 2006. ^ Morgan 2005, p. 32. ^ a b Greenhalgh 1975, p. 15. ^ a b Morgan 2005, pp. 33–34. ^ Greenhalgh 1975, pp. 7–11. ^ a b Donahue 2009. ^ Greenhalgh 1975, pp. 30, 37, 45, 47–54. ^ Galba's regal name has an equivalent meaning in English as "Commander Servius Galba Caesar, the Emperor". ^ As Pharaoh of Egypt, Galba adopted the titulary Autokrator Servios Galbas ("Emperor Servius Galba"). Donahue, John (7 August 1999). "Galba". De Imperatoribus Romanis. Retrieved 25 March 2019. "Galba". The Royal Titulary of Ancient Egypt. Retrieved 13 March 2018. Morgan, Gwyn (2006). 69 A.D.: The Year of the Four Emperors. New York: Oxford University Press. ISBN 9780195124682. Lendering, Jona (2006). Galba. Livius.org. Retrieved 25 March 2019. Tranquillus, C. Suetonius (2018) . De Vita Caesarum [The Lives of the Twelve Caesars] (in Latin). Translated by Rolfe, J. C. DOVER PUBNS. ISBN 9780486822198. Wellesley, Kenneth (1989). The Long Year A.D. 69. Bristol: Bristol Classical Press. ISBN 9781853990496.